To a Great City, the second edition of stillspotting nyc, is a collaboration between composer Arvo Pärt and NYC/Oslo architectural firm Snøhetta. It consists of five stillspots—specially chosen locations where “locals and visitors can escape, find respite, and make peace with space in this ‘city of 8 million.’” Each location is coupled with a composition by Pärt (which is either playing out of speakers or an iPod provided by one of the many friendly, helpful stillspotting volunteers) and adorned with at least one weather balloon. Yesterday, intern Jeremiah Budin embarked on a journey to visit each stillspot, turning emotion and gravitas into a handy ranking guide. The set-up: A small, circular clearing in Battery Park, semi-concentric stone paths, one nice-looking tree, some interesting benches. And the weather balloons. Stillness Level: The clearing itself, such as it was, was still enough, but it was surrounded by Battery Park and a busy street, so there was plenty going on. Also, there were a lot of other visitors shuffling around in a trance-like state, but we’re not sure if it’s fair to count that against it. 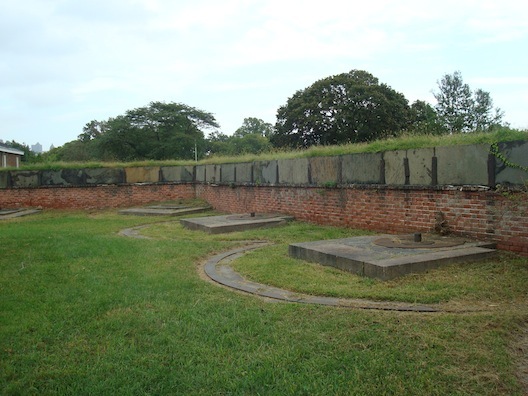 The set-up: Grass, low brick wall lined with things you would mount cannons on, sinister-looking trees. 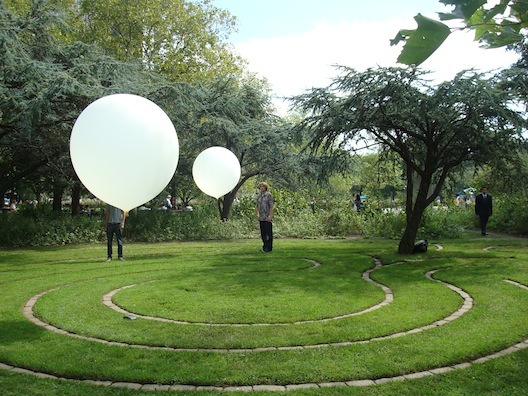 Weather Balloons: One, but the wind was picking up so it was getting a lot of work. Music: Intense, ominous violins. We’re sensing a pattern. Stillness Level: Governor’s Island is inherently more still than Battery Park, but the wind, music, and scary trees all combined to make it seem like something bad was about to happen, like how you might feel before a battle. Although that could have just been the cannon thingies. Emotional Connection: Is “sense of foreboding” an emotion? It is, right? The set-up: A stone tunnel leading to four bare, stone, torture chamber-ish rooms. Each room had a different colored light bulb that was not emitting a whole lot of light. In one of the rooms there was a lady swaying back and forth, possibly having some sort of religious experience. We don’t think she was part of the installation. 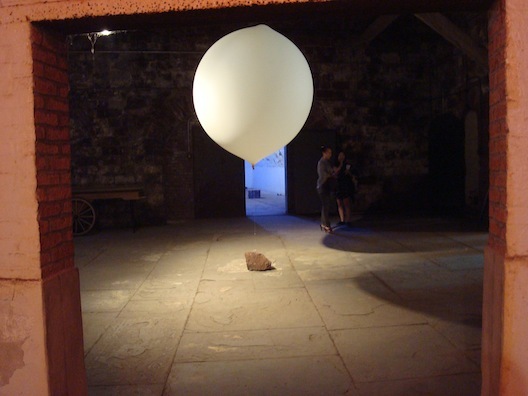 Weather Balloons: One, but it was huge. Music: Really sad, like what would play during the credits of movie where all the characters die. Stillness Level: High. Everything was very cold and made out of stone. Emotional Connection: Melancholy. This is it! We’re feeling something! The set-up: A large staircase in a very ornate lobby where everything was made out of marble; intricate, gothic carvings; domed ceilings; stained glass; the works. This was the most controlled site—we were ushered into the building in groups, and everybody sat on the stairs for the duration of the song. 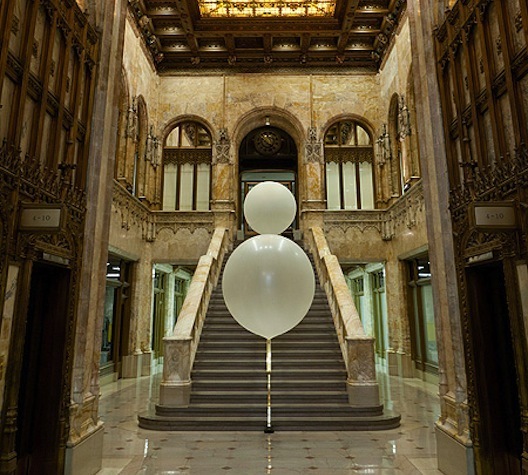 Weather Balloons: Two, on the stairs. Music: Twenty minutes of opera. Stillness Level: Ruined by the 6-8 security guards that were wandering around the lobby at any given moment. Emotional Connection: Nope, lost it. 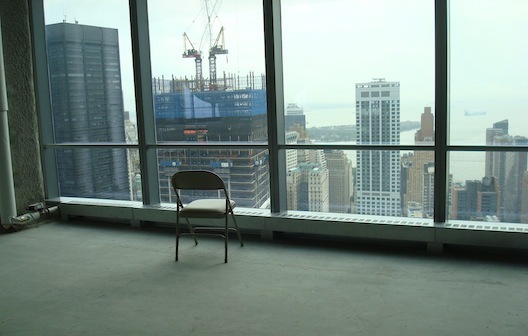 Consisted Of: A huge, open space; some chairs; no walls, just windows, an awe-inspiring view of the city, the Hudson, and Ground Zero. Stillness Level: As still as it felt to be underground in the magazine, there is something incredibly tranquil about being 46 floors up, looking out over an enormous city. Combine that with the emptiness of the space itself, and you have one still spot. Emotional Connection: According to the description provided on the information sheet they give you at the beginning of the tour, this spot is meant to “urge visitors to look forward and beyond,” and you know what? Goddamn it, it worked. Looking out over the city in all its immensity, reflecting on the day’s journey, we were filled with… feelings. What kind of feelings, we’re not sure, but they were feelings that came from Art and that makes them at least five times as valuable as regular feelings.